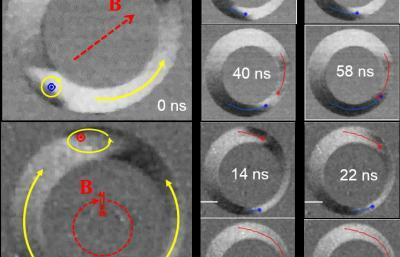 Researchers from Helmholtz-Zentrum Berlin developed a robust and reliable magnetization switching process - that could one day lead to highly efficient spintronics memory devices. The researchers used domain wall displacement to switch between two possible vortex states - without any applied field. The basic idea is to use tiny tings which have slightly displaced holes.